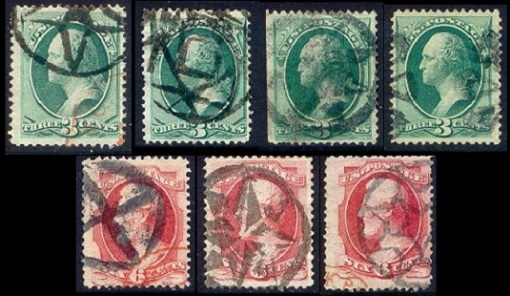 US Classic Stamps offer endless possibilities for the philatelic study of early postmarks. One of the most popular areas is in the study of the fancy cancellations of the New York Foreign Mail (NYFM) Office, used between 1870 and 1880. During the late 19th Century, and into the early part of the 20th Century, it was against postal regulations to use a town / date postmark over on top of the postage stamp on an envelope. The postmark could appear elsewhere on the envelope, but the postage stamp had to be canceled with an obliterating type of device, usually a cork or rubber device, referred to as a "killer". Some postmasters and clerks in the 19th Century, carved fancy designs into cork or rubber, to use in canceling the stamps. Some of these designs were crude, just smudges, but others were beautiful geometric designs. In 1870, the New York Foreign Mail Office began using some of these fancy cancel designs on outgoing international mail. 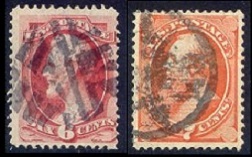 This sets them apart from any other fancy cancels used by any other US city, as the mail to foreign destinations generally used the higher denominations of the current postage stamps, from the 6 Cent through the 90 cent. In all, over 200 designs of these cancels exist. All postmark collections are composed of whatever the collector deems appropriate, based on their goals and pocketbooks. A nice representative collection can be made of each type of cancel, for a moderate cost. 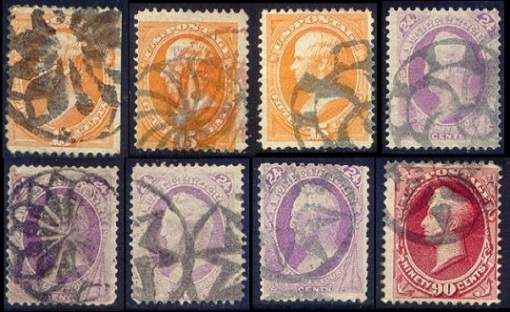 Or the collector can try to get as many different cancel types on as many different issues of the period that they can. 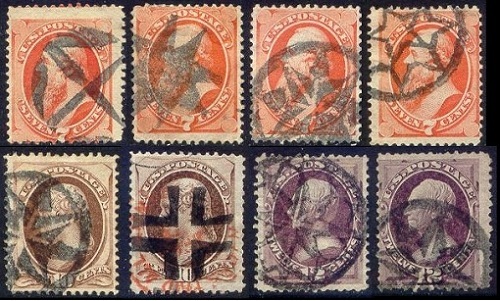 And then there are covers, but covers with these stamps and cancellations can get very expensive. When I collected the stamps shown in this "gallery" back in the 1980's and 1990's, I tried to get as many cancels as I could, on each issue and each denomination of the Banknote Series (1870-1890). Of course, the stamps were much cheaper then. It may have been over-kill, but I almost never passed up on a well struck, pretty cancel, when I found one, even though I might have had multiple copies of that particular stamp with the particular NYFM cancel. The GALLERY below, and in Part 2, shows images of most of the NYFM cancels that I was able to collect. Although I sold my US collection back in the late 1990's, I did manage to scan a great number of stamps from the collection. I am sharing some of those scans, arranged by issue and denominations. Please enjoy them!